subliminalrabbit: it's a good one. not very grand, i know, but at least i have ryan here to celebrate with me. (thanks, mom, for the awesome balloon!) everyone in the office seems to have their televisions on and i can't believe the networks have superceded soaps for all-day coverage of the inauguration. it's just wonderful. also wonderful? she's done! * although the mrs darcy cardi wasn't the super-easy stockinette sweater i was hoping for, i really love her and recommend this knit to more advanced knitters who've made sweaters in the past. there are a number of errors in the instructions, but the fixes are pretty intuitive, and i found that knitting the body in the round really helped. if i were to knit it again, i'd increase the length of the armscythes and sleeve caps by a couple of rows - the arm holes are a bit snug, but not uncomfortable. also, the yarn (knit picks shine worsted)? super sheddy. but so soft and kinda shiny. *sorry for the bleary-eyed weird-pose wet-hair photo. early AM, first day of the work week and all. 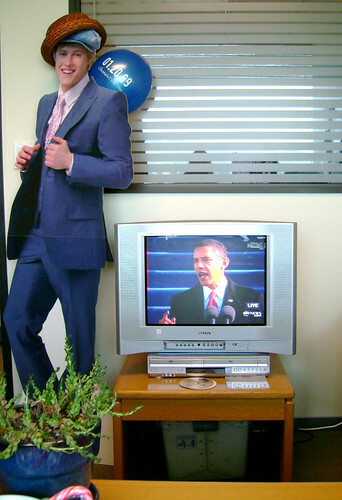 also, michelle, hope you don't mind i stole your photo of me. I think Ryan is looking particularly reverent during the Inauguration. I'm glad you like the pic, use it as much as you wish! And can I just say, EW linkage? Squeee! 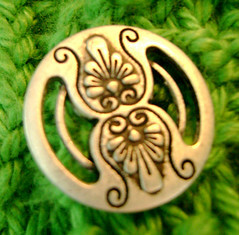 Gorgeous buttons- sweater turned out great. holy moley mama. Wicked link back from EW. I am in a state of shock. Great cardigan, and lovely buttons!! nice work, lady! I love the cardi (along with everything you make!). 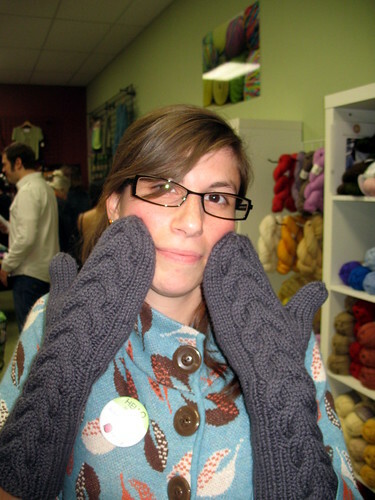 But i was really wondering if you could email me Bella's mittens pattern and also the armwarmer pattern as i can't seem to bring it up, and i so want to make both of them! Thankyou so much if you could, my email is roges003@westberks.org.